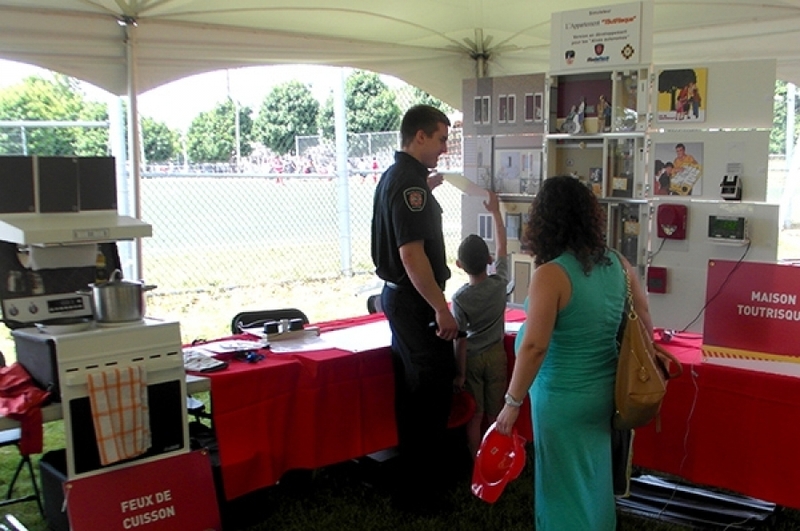 The Montreal Fire Department (Service Sécurité Incendie de Montréal or SIM) teaches fire safety to audiences of all age groups using a full suite of Modeltech simulators, including the original Hazard House, the Hazard Kitchen with stovetop module and our newest Hazard Apartment adapted for senior audiences. As early as 1995, the SIM was part of the development team for the original Hazard House. Officers from the Public Education Department and Modeltech Int’l designers worked together to create a new brand of fire safety simulators. Since then, several new models were designed, including the Hazard Kitchen and more recently, the Hazard Apartment for Seniors. This latest Hazard Apartment for Seniors simulator was designed with the help of Captain Eric Tisseur, who suggested adding several technical features. Interactive smoke detectors, backlit exit signs and a stroboscopic alarm activated from a real pull station all prove how important SIM’s contribution was in making our simulators even more relevant to audiences. The SIM’s fully equipped simulator also includes a “hood vent” module with LCD screen, showing how fire can spread inside an air duct – another custom request from Captain Tisseur that our R&D successfully delivered. The SIM has made extensive use of our fire safety simulators during neighborhood fairs as well as community events throughout the summer. A full range of public education equipment allows the Fire Department to reach audiences of all age and ethnic groups, in order to maximize retention of safety messages and promote good habits. Neighborhood fairs and community events are perfect opportunities to teach the public about fire safety.